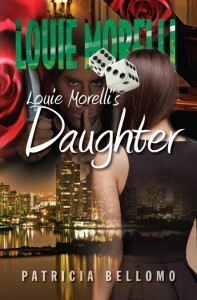 Bellomo’s Mob Thriller Book, Louie Morelli’s Daughter. High praise for the third novel in Bellomo’s “Louie Morelli” series. Stella “Morelli” Romano has always been a daddy’s girl, but she doesn’t dare tell her father that her feckless husband, Johnny, has mortgaged the mini-mansion Louie gave her for a wedding present. Johnny is supposed to use the money to pay off his loan sharks, but he blows the money in Vegas, and his unsavory creditors seize Stella as collateral. In one terror-filled night, Stella’s world is turned upside down. While Stella struggles to stay alive, Louie and his associates set a trap for the kidnappers. From glitzy Palm Beach to the streets of Detroit and back alleys of New Orleans, Louie’s revenge is plotted and extracted. Louie is determined that anyone who harmed his baby will pay, including Johnny. But he risks alienating Stella, who is slowly being transformed from daddy’s darling to an accomplice to murder.